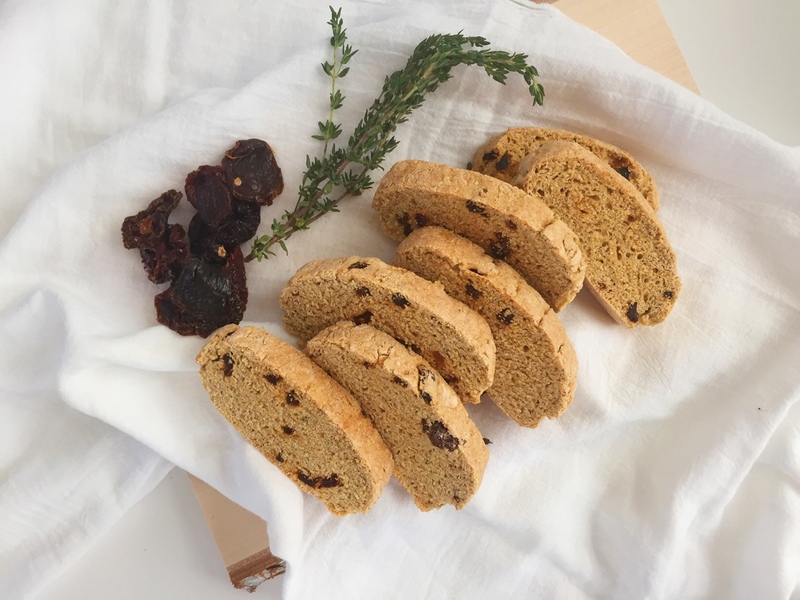 Savory Sun-Dried Tomato & Asiago Biscotti – A Healthy Pinch. When I think of biscotti, I think of a sweet, crunchy biscuit that is meant to be enjoyed with my morning coffee. I have made them once before, a double-chocolate ginger version, which was love at first bite. However, when I saw a savory biscotti recipe in my Food & Nutrition magazine there was no hesitation- I was ready to give them a shot. And let me tell you, it was worth it! 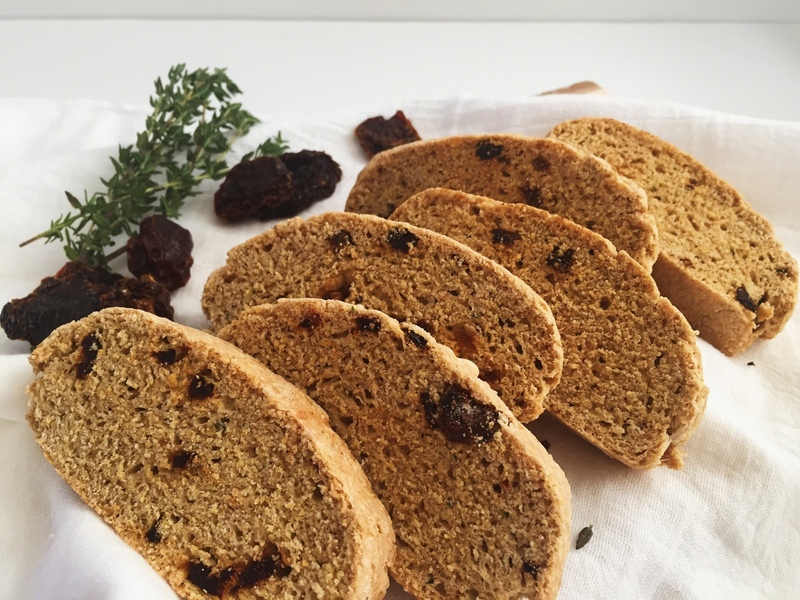 A winning combination of sun-dried tomatoes, Asiago, garlic and thyme not only taste delicious, but also make your kitchen smell divine while baking. Preaheat oven to 375°F. Line large baking sheet with parchment paper. In a large bowl, whisk flours, cornmeal, baking soda, baking powder, garlic powder, salt and pepper until combined. Add sun-dried tomatoes and cheese to the flour mixture and stir until just combined. In a separate small bowl, combine buttermilk, eggs and melted butter. Pour buttermilk mixture into flour mixture and stir until dough is sticky and just combined. Separate dough into two equal portions. Working with one section at a time, trasfer dough onto parchment paper and mold dough into 10×3-inch rectangle. Flatten slightly to 1-inch height. Bake at 375°F for 25 minutes or until toothpick comes out clean. Let cool for 1 hour. After biscotti have cooled, preheat oven to 325°F. Using a serrated knife, cut loaves into 1/4 to 1/2-inch slices. Replace each slice, cut side down onto engrossed baking sheet and bake at 325°F for 12 minutes. Turn slices over and sprinkle with 1/2 tsp Asiago cheese per slice (if desired). Bake for additional 15 minutes. Transfer biscotti to wire racks to cool. **Note: buttermilk substitute can be easily made with regular (or almond) milk and lemon juice or vinegar. For the how-to, go here.